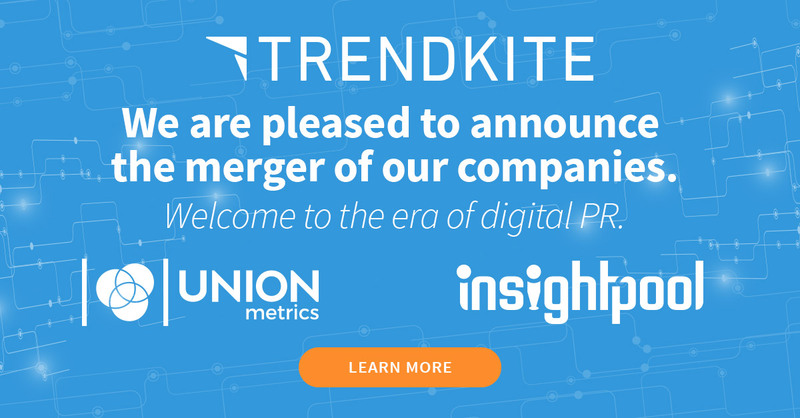 Today, we’re incredibly excited to announce that Union Metrics is merging with TrendKite and Insightpool. We’re combining TrendKite’s AI-driven earned media measurement platform, Insightpool’s social influencer data, and our social marketing intelligence to create one company focused on meeting next century’s digital marketing challenges. You’ll continue to have the same Union Metrics social analytics you’ve always had; we’re not going anywhere. This includes everything from our Social Suite to our free tools. We’re bringing our social analytics capabilities to the TrendKite platform, along with Insightpool’s influencer data, so there’s lots more coming soon to help you meet all your earned and social media challenges. We started working with TrendKite earlier this year as their social intelligence partner. It became immediately clear how well our products and teams complemented each other, and how there was a underserved need in the market for a modern comprehensive solution for communications professionals — something that connects social, owned and paid media with earned. The future of communications is about being able to reach the right audience at the right time, measure your efforts, and tie it all back to the value this brings to your business. In particular, this requires a new way of thinking about PR. The new TrendKite will enable customers to create, curate, measure and optimize trust through earned media at scale. With our holistic digital PR platform, you can finally understand – and expand – PR’s impact on your entire digital marketing mix. We’re so excited about the next step in the Union Metrics journey, and we want to thank you for taking it with us, now and in the future. -Hayes Davis and Jenn Deering Davis Founders, Union Metrics We’ll be hosting a webinar in a few weeks to talk about digital PR and what it means for marketers. Join us to discuss the marketer’s guide to the discipline of digital PR on July 24. Register here. And if you have any questions at all, please let us know. Find us on Twitter at @UnionMetrics or at unionmetrics.com.